Computers are way too fancy these days, with their gigabytes of memory, gigahertz of multiple processing cores, hyper-parallel GPUs and terabytes of storage. Sometimes we nerds yearn for a simpler age, when processors were real processors and programmers were real programmers. But what to do with such a thing? 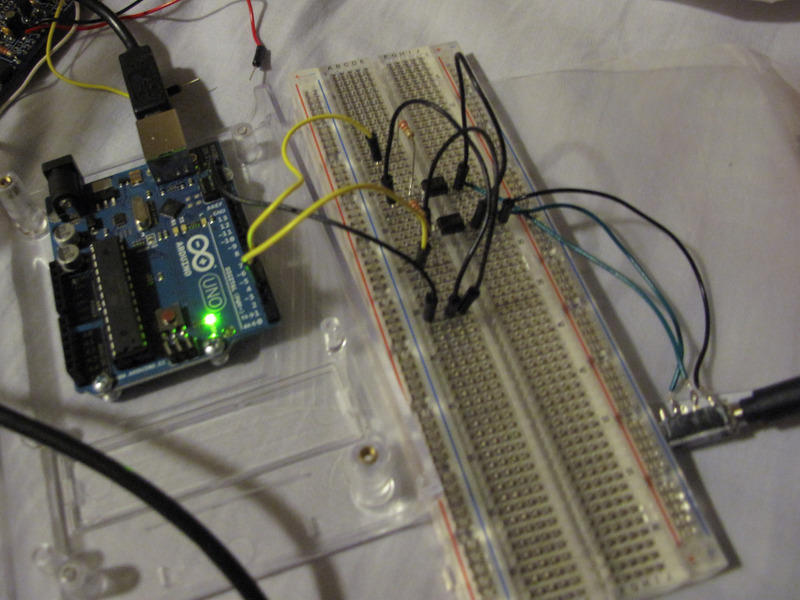 I rapidly got it to blink morse code on a tiny on-board LED upon receiving terminal data, but that seemed too simple. I needed something altogether fancier; something that tied in with my frankly excessive number of cameras; a project that absolutely nobody had ever thought of before. 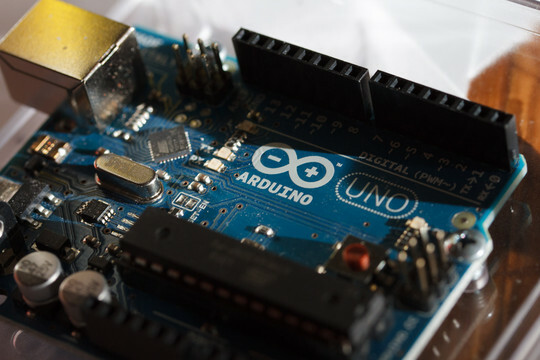 So, an Arduino Intervalometer was it - seemingly a nice and straightforward introduction to programming something less powerful than my first computer, back in 1988. Low-end Canon (350D, 400D, 450D etc.) external trigger. Short 'focus' to 'ground' to focus, 'shutter' to 'ground' to release shutter. High-end Canon (40D, 7D, 5D etc.) external trigger. Same as before. Best to test wires inside the cable by shorting them while it's connected to the camera - otherwise it's impossible to identify the gits. My Canon PowerShot G10 had the 2.5mm connector, the same as my converted-to-infrared EOS 350D. But the 7D? A distinctly non-standard Canon effort. How to obtain a connector without buying an expensive Canon remote trigger? Turned out to be simple - by buying a cheap trigger from Amazon. Easy! Chop cable and connector off, tease out internal wires, identify them and that's it. I decided on using 3.5mm audio cables as extensions, using a 3.5mm-to-2.5mm adaptor for the lower-end cameras and soldering a 3.5mm headphone-style jack onto the end of the higher-end cable when it eventually arrived. 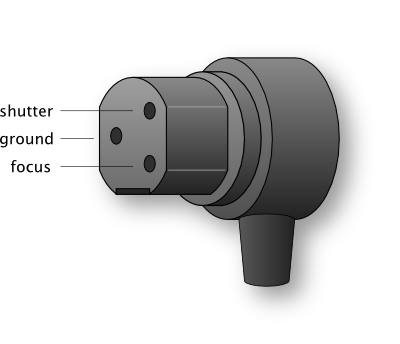 A 3.5mm headphone socket would act as the connector into my circuitry. 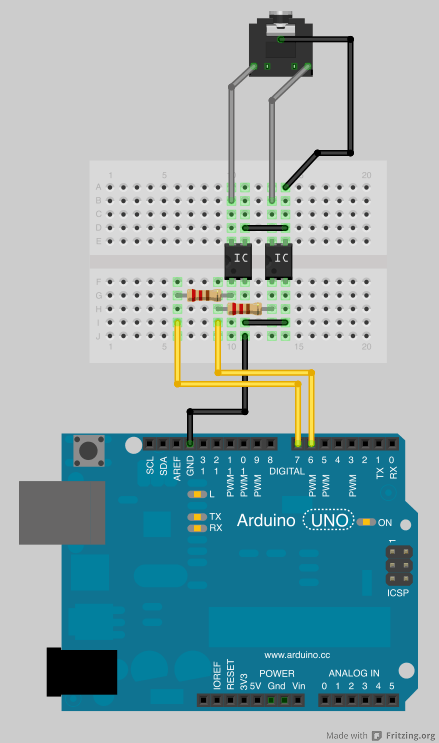 After breadboarding-up a brainless version with a couple of microswitches, I started looking into interfacing with the Arduino. One problem being that the protocol is so utterly dumb that it ignores such niceties as 'digital levels' and 'known voltages'. I needed something to isolate the camera with its mysterious voltages and currents. Relays? Too chunky, and moving parts are noisy and prone to wear. Only one thing for it: opto-isolators. While trying to find where to buy the blighters (Radio Shack had a fine line in antiquated relays suitable for Edison-style currents), I checked SparkFun online - where they not only had some opto-isolators perfect for interfacing with an Arduino, but someone in the comments had already used the things to control a camera. The connector may or may not be round the right way. Please take with a pinch of salt - reverse '6' with '7' if it goes wrong. 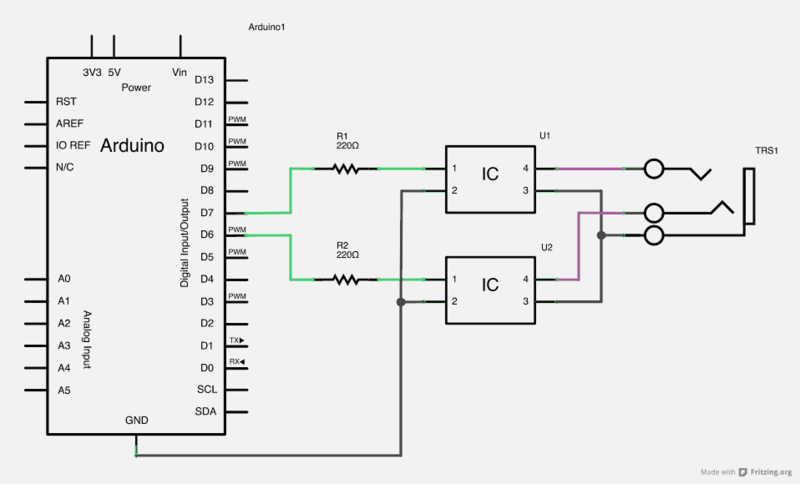 Bonus schematic here. Actually, I did get it the right way round. Yay! And there I had it - an intervalometer taking a photo every ten seconds. Focus 800ms, shutter 200ms, wait 9000ms. Obviously not. I now had to turn it into something fancy. To be continued! THE DANGER IS IN A PARTICULAR LOCATION - IT INCREASES TOWARD A CENTER. THE DANGER IS STILL PRESENT - IN YOUR TIME - AS IT WAS IN OURS.